Seniors’ and Elders’ Month is Coming! Are you ready? 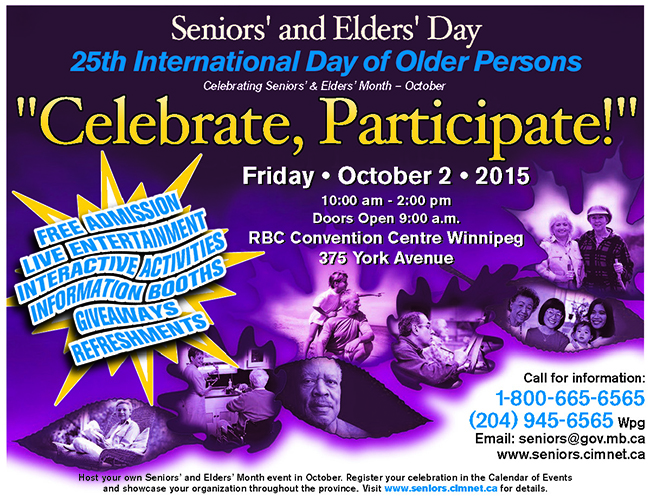 The Seniors’ and Elders’ Day Community Planning Committee is very excited to announce that Seniors’ and Elders’ Day 2015 will take place on Friday, October 2, 2015, at the RBC Winnipeg Convention Centre, 375 York (Main Floor), celebrating the energy, vitality, and strength of seniors in Manitoba!